This may just be the ultimate comfort food mash-up. There are plenty crazy pizzas that have popped up in the past few years. Some, like a pie covered in tacos, have taken the internet by storm and inspired hundreds of pizza enthusiasts to stand in line just to grab a slice. Now, the creator behind that wild dish has collaborated with TODAY Food to create an even more over-the-top pizza. Drum roll, please ... Introducing, the Spaghetti Pie Pizza, which officially made its debut on Tuesday at Tony Boloney's in Hoboken, New Jersey. 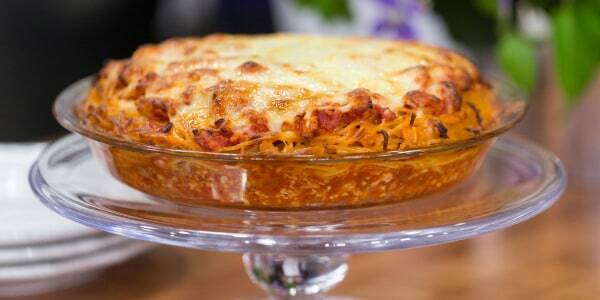 The crust of this amazingly delicious pie is made with — you guessed it — spaghetti! Pizzeria owner Mike Hauke is the mad genius behind the insane dish, and the foodies at Devour Power captured this behind-the-scenes video of how he makes the spaghetti pie pizza. The inspiration for his spaghetti pie pizza came from a dish that his wife's grandfather used to make when he was alive. Papa Charlie's macaroni pie was a legendary family dish that everyone looked forward to eating on special occasions. When Papa Charlie made his famous recipe, he'd combine pasta with a mixture that included five dozen eggs, tons of cheese and lard. He packed the cheese sauce-coated pasta into a pan that was 6 inches deep and baked the dish until the top was super crispy. "The first time I saw him make it, I told him that he was going to give someone a heart attack," Hauske told TODAY Food. Once Hauske tasted the macaroni pie, he fell in love with the texture of the dish. In honor of Papa Charlie, Hauske took the core elements of the dish and "Tony Boloney-fied it," as he told TODAY Food. The base of Hauske's spaghetti pizza pie is made with fresh, homemade spaghetti that's combined with an updated cheese sauce mixture. Hauske skipped the lard that Papa Charlie used and added many other ingredients that help give the pizza its amazing crispy, golden crust. The cheese sauce mixture is made with eggs (24 of them! ), heavy cream, melted butter, olive oil and 1 pound each of grated pecorino, homemade mozzarella and shredded provolone cheeses. The cheesy goodness doesn't end once the coated pasta is put in the pizza pan. Hauke sprinkles on lots of shredded scamorza cheese before the pie is baked in a pizza oven. Even after all of that savory deliciousness is added, the pizzeria owner's masterpiece still isn't complete. Papa Charlie never topped his macaroni pie with additional ingredients, but Hauske likes to pile on the toppings. The pizza gets covered in a spicy vodka sauce that's spiked with Calabrian chiles. Then, it's topped with fresh, homemade burrata cheese. A sprinkle of torn fresh basil is the final fragrant touch. 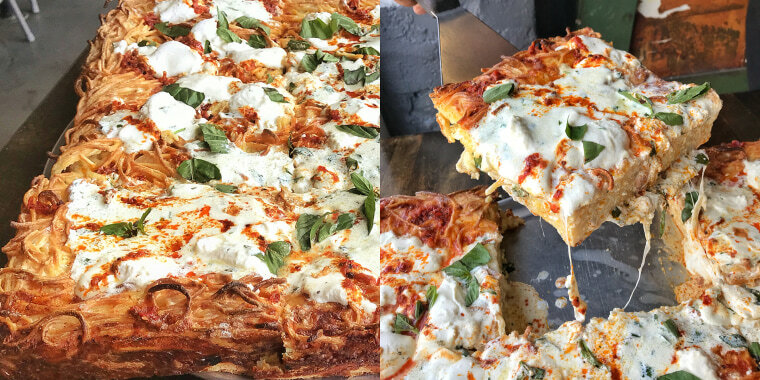 Each slice of the spaghetti pizza pie is so huge that any person who eats it will definitely need to use two hands to get a grip on this insane comfort food mash-up. "My favorite part is the crunchy pasta," Hauske told TODAY Food about his creation. His amazing spaghetti pie pizza is now available for a limited time at the Tony Boloney's location in Hoboken, New Jersey. Expect a line and don't forget to pick up a slice of his crazy taco pie, too! Would you eat a pizza with tacos on it?